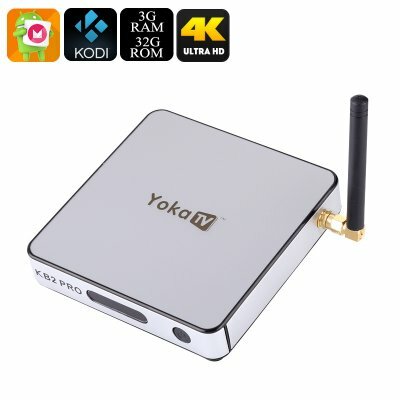 Successfully Added YOKA TV KB2 Pro Amlogic S912 TV Box - Android 6.0, 4K Video Support, Miracast, Airplay, Octa-Core CPU, 3GB RAM, 32GB Storage to your Shopping Cart. Turn your living room into your own private cinema with the YOKATV KB2 Pro Amlogic S912. This absolutely stunning 4K TV box allows you to enjoy the latest movies, series, games and TV applications in breathtaking 4K resolution. Never before have you experienced your favorite media in such high detail and vivid color. With the YOKATV KB2 Pro at your disposal, you will be able to enjoy a cinematic experience every night from the comfort of your own living room. Simply sit back, grab some popcorn, and invite over your friends – with this Android TV box countless hours of entertainment will lay ahead. Being the perfect smart home accessory for any modern household and office out there, the YOKATV KB2 Pro is guaranteed to bring along unlimited fun for you and all your loved ones – assuring that you’ll never have to be bored again. Running on an Android 6.0 operating system, this Android TV box brings along a smooth and powerful user experience that does not only allows you to enjoy the latest movies and series, but also provides you access to browse the web, play the latest games, and enjoy the best Android TV applications. Its Octa-Core CPU that has been clocked at 1.5GHz is capable of dealing with the most demanding of tasks – assuring that this Android 6.0 TV box will handle whatever you throw at it with ease. Additionally, the YOKATV KB2 Pro Amlogic S921 also features a stunning 3GB of RAM thanks to which you’ll be able to efficiently multitask and enjoy numerous of the amazing features this 4K TV box has to offer simultaneously without slowing down your device. Supporting both Wi-Fi and Bluetooth – this Android TV box does not only allow you to browse the web but also lets you sync it with your beloved smartphone. Its miracast feature conveniently lets you mirror all that’s happening on your smartphone's or tablet’s display straight onto your big screen TV – allowing you to enjoy all your phone’s features on a large screen and thus letting you take the most out of your smartphone and your television at the same time. Airplay additionally allows you to pair up your iOS Apple devices with this truly amazing TV box just like any other Apple TV would – making this Android TV box perfect for Android and iOS users alike. By featuring 32GB of internal storage and supporting the input of an additional 32GB of external memory, this Android TV box holds plenty of storage for you to save your favorite games, movies, series, and applications. Simply head out to the Play Store or use Kodi TV to gain access to an unlimited pool of mobile entertainment – with this 4K TV box you can be assured that you’ll never have to be bored again. Great for everybody that like to take the most out of their television – the YOKATV KB2 PRO is perfect for watching the latest movies and series in ultra-HD 4K resolution, playing games, browsing the web, and conveniently using the best smart home TV applications. The YOKATV KB2 Pro Amlogic S912 TV Box comes with a 12 months warranty, brought to you by the leader in electronic devices as well as wholesale electronic gadgets..